We see that one possibility is to use the word "faith," but it's hard to use these word consistently, because in English there is no cognate verb form (i.e., "to faith"). We can use the pair "believe/belief" or the word "trust" (both a noun and verb) as other good options. As common as it is in English, I have been a bit reluctant to use the word "faith," because it seems to me to convey a static concept. In the hoary history of pistis/πιστις, Smyth (Greek Grammar, section 840a) notes that substantives ending in si(s)/σις are used to denote the abstract idea of the verbal action. At least in its origin, therefore, pistis/πιστις is probably better rendered as "believing" as a way of show that it is a dynamic concept. There are 26 hits here (returned in .05 seconds! ), and since that isn't so many, it doesn't take too long to weed through them and find out which ones are actually the "have faith" construction. In Logos, it is an easy matter as well to find all the instances of pisteuo/πιστευω. 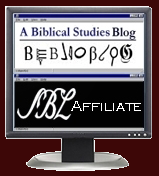 The fastest way is to use the Bible Speed Search with the NA27 text. Results are nearly instantaneous. It takes a little longer to conduct a Greek Morphological Search for the echo/εχω and pistis/πιστις in the accusative case. Where I can quickly jump to the command line in BW7 and type the command as seen in the graphic above, in Logos, it takes just a bit of time for the search dialog to open. Then I first have to make sure I have the right combination of Bibles, Morphology, and Range set. (If you get 0 results on a search, and you are pretty sure you should have some hits, this is probably the problem.) Next, I have to toggle to the Greek keyboard and enter the echo/εχω lemma and add it to the search. Toggle back to the English keyboard and type in "AND." Toggle back to the Greek keyboard and type in pistis/πιστις in the Form box, and then select Noun and Accusative. (Does someone know of a faster way in Logos to do this? I realize I could just type everything in on the Greek Morph. Search command line, but I still would need to be toggling keyboards, and there are not coding helps as BW7 provides to guide me as I type.) The results are returned quite quickly, not BW7's .05 seconds, but search time is certainly not an issue here. (To make sense of the following, you probably need to have Logos and play with the Syntax Search dialog options.) Here is a video of how I constructed the search, and below that written out are the steps I took. You will see that I started with a clause and indicated by using the check boxes that it could be an Embedded, Primary, or Secondary clause. Next I selected a clause component and indicated that it did not have to be an immediate child, but that it should be a Predicator. Then I told it that I wanted a Word. It did not have to be an immediate child, but I did want it highlighted, and I typed out echo/εχω in Greek in the Lexeme box. Next I indicated that Anything could be next to account for any modifiers that might occur between the Predicator and the Complement. Then I again selected a clause component and indicated that it did not have to be an immediate child, but this time that it should be a Complement. Again I told it that I wanted a Word. It did not have to be an immediate child, but I did want it highlighted, and I typed out pistis/πιστις in Greek in the Lexeme box. I also edited the Morphology to indicate that the noun should be in the accusative case. I added an "OR" statement. Then with Clause 1 selected, I used "Copy" to reproduce it. Then I exchanged the position of the Predicator and Complement in Clause 2 to cover instances when their order might be reversed. The result produced exactly the 12 correct instances of "have faith" in the NT: Matthew 17:20; 21:21; Mark 4:40; 11:22; Luke 17:6; Acts 14:9; Romans 14:22; 1 Corinthians 13:2; 1 Timothy 1:19; James 2:1, 14, 18. It is clear, therefore, that the NT authors certainly preferred by a 241 to 12 ratio to use the verbal form pisteuo/πιστευω rather than the composite expression of echo/εχω and pistis/πιστις. Except in those 12 instances, I would argue that we would at least want to use "believe" or "trust." Thank you for sharing both the results here of your quick study, but also the tools and the process. It's rare to find someone showing and evaluating language research methods, and even rarer to see it with such detail and clarity. (I've been relying on open source stuff for my work in Greek but may, now, want to invest in one of the software programs you mention here). Xaris kai irene! offer a number of other helpful training tools. 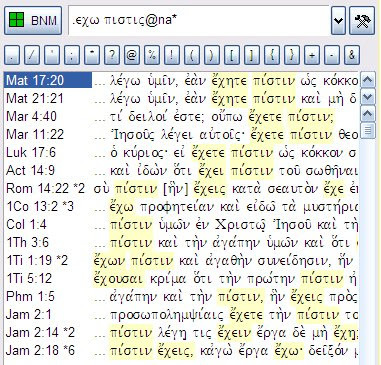 You can actually use Logos' Bible Speed Search to do morph queries, lexical form queries, and mixes of the two. You just need to know the identifier for the morph in question and a little about fields. The "lemma:" denotes a field; lemmas in morph texts are in the 'lemma' field. This disambiguates from any instance of that same string in the main text. "LogosMorph" is the scheme identifier for the Logos morphology, the code order is the same as that found in the interlinear resource. The "andequals" operator is a way of searching for where two pieces of data (here the lemma and the morph code) are indexed at the same point in the text (so, at the point of the word in the running text of the edition). Parentheses define groups/precedence. In both instances, it looks like the same 16 verses are found; and the list appears to match with the list you give in your post above.